The Hanging Gardens of Babylon were one of the Seven Wonders of the Ancient World as listed by Hellenic culture, described as a remarkable feat of engineering with an ascending series of tiered gardens containing a wide variety of trees, shrubs, and vines, resembling a large green mountain constructed of mud bricks, and said to have been built in the ancient city of Babylon, near present-day Hillah, Babil province, in Iraq. Its name is derived from the Greek word kremastós (κρεμαστός, lit. "overhanging"), which has a broader meaning than the modern English word "hanging" and refers to trees being planted on a raised structure such as a terrace. 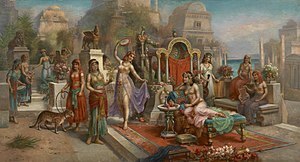 According to one legend, the Hanging Gardens were built alongside a grand palace known as The Marvel of Mankind, by the Neo-Babylonian King Nebuchadnezzar II (who ruled between 605 and 562 BC), for his Median wife Queen Amytis, because she missed the green hills and valleys of her homeland. This was attested to by the Babylonian priest Berossus, writing in about 290 BC, a description that was later quoted by Josephus. The construction of the Hanging Gardens has also been attributed to the legendary queen Semiramis, who supposedly ruled Babylon in the 9th century BC, and they have been called the Hanging Gardens of Semiramis as an alternate name. The Hanging Gardens are the only one of the Seven Wonders for which the location has not been definitively established. There are no extant Babylonian texts that mention the gardens, and no definitive archaeological evidence has been found in Babylon. Three theories have been suggested to account for this. One: that they were purely mythical, and the descriptions found in ancient Greek and Roman writers including Strabo, Diodorus Siculus and Quintus Curtius Rufus represent a romantic ideal of an eastern garden. Two: that they existed in Babylon, but were completely destroyed sometime around the first century AD. Three: that the legend refers to a well-documented garden that the Assyrian King Sennacherib (704–681 BC) built in his capital city of Nineveh on the River Tigris, near the modern city of Mosul. Josephus (c.37–100 AD) quotes a description of the gardens by Berossus, a Babylonian priest of Marduk, whose writing circa 290 BC is the earliest known mention of the gardens. Berossus described the reign of Nebuchadnezzar II and is the only source to credit that king with the construction of the Hanging Gardens. In this palace he erected very high walks, supported by stone pillars; and by planting what was called a pensile paradise, and replenishing it with all sorts of trees, he rendered the prospect an exact resemblance of a mountainous country. This he did to gratify his queen, because she had been brought up in Media, and was fond of a mountainous situation. Diodorus Siculus (active c.60–30 BC) seems to have consulted the 4th century BC texts of both Cleitarchus (a historian of Alexander the Great) and Ctesias of Cnidus. Diodorus ascribes the construction to a Syrian king. He states that the garden was in the shape of a square, with each side approximately four plethra long. The garden was tiered, with the uppermost gallery being 50 cubits high. The walls, 22 feet thick, were made of brick. The bases of the tiered sections were sufficiently deep to provide root growth for the largest trees, and the gardens were irrigated from the nearby Euphrates. Quintus Curtius Rufus (fl. 1st century AD) probably drew on the same sources as Diodorus. He states that the gardens were located on top of a citadel, which was 20 stadia in circumference. He attributes the building of the gardens to a Syrian king, again for the reason that his queen missed her homeland. The account of Strabo (c.64 BC – 21 AD) possibly based his description on the lost account of Onesicritus from the 4th century BC. He states that the gardens were watered by means of an Archimedes' screw leading to the gardens from the Euphrates river. The last of the classical sources, thought to be independent of the others, is A Handbook to the Seven Wonders of the World by Philo of Byzantium (writing in the 4th to 5th century AD; not to be confused with Philo of Byzantium, who lived ca. 280 BC – ca. 220 BC). The method of raising water by screw matches that described by Strabo. Philo praises the engineering and ingenuity of building vast areas of deep soil, which had a tremendous mass, so far above the natural grade of the surrounding land, as well as the irrigation techniques. It is unclear whether the Hanging Gardens were an actual construction or a poetic creation, owing to the lack of documentation in contemporaneous Babylonian sources. There is also no mention of Nebuchadnezzar's wife Amyitis (or any other wives), although a political marriage to a Median or Persian would not have been unusual. Many records exist of Nebuchadnezzar's works, yet his long and complete inscriptions do not mention any garden. However, the gardens were said to still exist at the time that later writers described them, and some of these accounts are regarded as deriving from people who had visited Babylon. Herodotus, who describes Babylon in his Histories, does not mention the Hanging Gardens, although it could be that the gardens were not yet well known to the Greeks at the time of his visit. To date, no archaeological evidence has been found at Babylon for the Hanging Gardens. It is possible that evidence exists beneath the Euphrates, which cannot be excavated safely at present. The river flowed east of its current position during the time of Nebuchadnezzar II, and little is known about the western portion of Babylon. Rollinger has suggested that Berossus attributed the Gardens to Nebuchadnezzar for political reasons, and that he had adopted the legend from elsewhere. One proposal is that the Hanging Gardens of Babylon were actually constructed by the Assyrian king Sennacherib (reigned 704 – 681 BC) for his palace at Nineveh. Stephanie Dalley posits that during the intervening centuries the two sites became confused, and the extensive gardens at Sennacherib's palace were attributed to Nebuchadnezzar II's Babylon. Archaeological excavations have found traces of a vast system of aqueducts attributed to Sennacherib by an inscription on its remains, which Dalley proposes were part of a 80-kilometre (50 mi) series of canals, dams, and aqueducts used to carry water to Nineveh with water-raising screws used to raise it to the upper levels of the gardens. The name "Babylon", meaning "Gate of the Gods" was applied to several Mesopotamian cities. Sennacherib renamed the city gates of Nineveh after gods, which suggests that he wished his city to be considered "a Babylon". Only Josephus names Nebuchadnezzar as the king who built the gardens; although Nebuchadnezzar left many inscriptions, none mentions any garden or engineering works. Diodorus Siculus and Quintus Curtius Rufus specify a "Syrian" king. By contrast, Sennacherib left written descriptions, and there is archaeological evidence of his water engineering. His grandson Assurbanipal pictured the mature garden on a sculptured wall panel in his palace. Sennacherib called his new palace and garden "a wonder for all peoples". He describes the making and operation of screws to raise water in his garden. The descriptions of the classical authors fit closely to these contemporary records. Before the Battle of Gaugamela in 331 BC Alexander the Great camped for four days near the aqueduct at Jerwan. The historians who travelled with him would have had ample time to investigate the enormous works around them, recording them in Greek. These first-hand accounts do not survive into our times but were quoted by later Greek writers. King Sennacherib's garden was well-known not just for its beauty – a year-round oasis of lush green in a dusty summer landscape – but also for the marvelous feats of water engineering that maintained the garden. There was a tradition of Assyrian royal garden building. King Ashurnasirpal II (883–859 BC) had created a canal, which cut through the mountains. Fruit tree orchards were planted. Also mentioned were pines, cypresses and junipers; almond trees, date trees, ebony, rosewood, olive, oak, tamarisk, walnut, terebinth, ash, fir, pomegranate, pear, quince, fig, and grapes. A sculptured wall panel of Assurbanipal shows the garden in its maturity. One original panel and the drawing of another are held by the British Museum, although neither is on public display. Several features mentioned by the classical authors are discernible on these contemporary images. ^ a b c Stephanie Dalley (1993). 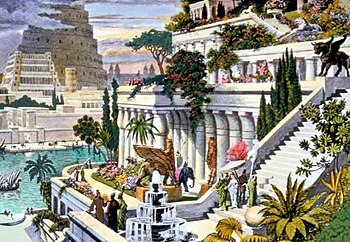 "Ancient Mesopotamian Gardens and the Identification of the Hanging Gardens of Babylon Resolved". Garden History. 21: 7. JSTOR 1587050. ^ a b c Reade, Julian (2000). "Alexander the Great and the Hanging Gardens of Babylon". Iraq. 62: 195. doi:10.2307/4200490. ISSN 0021-0889. ^ Foster, Karen Polinger (2004). "The Hanging Gardens of Nineveh". Iraq. 66: 207. doi:10.2307/4200575. ISSN 0021-0889. ^ a b "The Hanging Gardens of Babylon". Retrieved 5 February 2014. ^ a b Cartwright M (July 2018). "Hanging Gardens of Babylon". Ancient History Encyclopedia. Retrieved 15 September 2018. ^ a b c Finkel (1988) p. 41. ^ Finkel (1988) p. 58. ^ Finkel, Irving; Seymour, Michael (2008). Babylon: City of Wonders. London: British Museum Press. p. 52. ISBN 0-7141-1171-6. ^ "The Hanging Gardens of Babylon". Retrieved 5 February 2014. ^ Dalley, Stephanie (2013). The Mystery of the Hanging Garden of Babylon: an elusive World Wonder traced. Oxford University Press. ISBN 978-0-19-966226-5. ^ Finkel (2008) p. 108. ^ Dalley, Stephanie (1994). "Nineveh, Babylon and the Hanging Gardens: Cuneiform and Classical Sources Reconciled". Iraq. 56: 45. doi:10.2307/4200384. ISSN 0021-0889. ^ Joseph. contr. Appion. lib. 1. c. 19.—Syncel. Chron. 220.—Euseb. Præp. Evan. lib. 9. ^ Strabo, Geography XVI.1.5, translation adapted from H.L. Jones, Loeb Classical Library edn (1961). ^ That is, Philo the Paradoxographer of Byzantium, not Philo the Engineer of Byzantium. See Stephanie Dalley, "More about the Hanging Gardens," in Of Pots and Pans: Papers on the Archaeology and History of Mesopotamia and Syria as presented to David Oates on his 75th Birthday, Edited by L. al-Gailani-Werr, J.E. Curtis, H. Martin, A. McMahon, J. Oates and J.E. Reade, (London), pp. 67–73 ISBN 1-897750-62-5. ^ Dalley (2013), p. 40. Dalley bases her translation on Brodersen (1992) who uses an early Greek text. A previous translation by David Oates, based on a Latin text, is found in Finkel (1988) pp. 45–46. ^ Finkel (2008) p. 109. ^ Priestley, Jessica (2014). Herodotus and Hellenistic culture: Literary Studies in the Reception of the Histories. Oxford: Oxford University Press. p. 91. ^ Joan Oates, Babylon, Revised Edition, Thames and Hudson, London (1986) p. 144 ISBN 0500273847. ^ Alberge, Dalya (5 May 2013). "Babylon's hanging garden: ancient scripts give clue to missing wonder". The Guardian. Retrieved 6 May 2013. ^ Dalley, Stephanie (2013) The Mystery of the Hanging Garden of Babylon: an elusive World Wonder traced, Oxford University Press ISBN 978-0-19-966226-5. ^ See Dalley (2013) ch 1 for a summary. ^ Stephanie Dalley (2013). The Mystery of the Hanging Garden of Babylon: An Elusive World Wonder Traced. Oxford University Press. pp. 65–82. ISBN 978-0-19-966226-5. The quotations in this section are the translations of the author and are reproduced with the permission of OUP. Finkel, Irving (1988). "The Hanging Gardens of Babylon". In Clayton, Peter; Price, Martin (eds.). 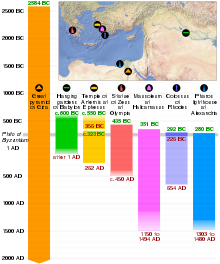 The Seven Wonders of the Ancient World. New York: Routledge. pp. 38 ff. ISBN 0-415-05036-7. Wikimedia Commons has media related to Hanging Gardens of Babylon.